Hello all, I have some unfortunate news. I have briefly mentioned The Boy in previous posts and we had been dating for about 3-4 months. While he is a great person, the relationship wasn't going anywhere and I just didn't have enough of a spark with him to continue with the relationship. So yesterday, I broke it off with him. I think I kinda caught him off guard but in the long run it's for the best. But know that I am okay but wanted to share what was going on. Honestly, I was spending more time trying to dodge him than be with him. Clearly that's a sign. Anyway, I have gotten some progress on my projects and here is the update. Since I finished the Gryffindor Scarf, I have been working on a few things but got the bug to work on the White Centered Grannies again. I really wanted to start putting it together and see the colors. I initially started with a whip stitch join and realized that was going to take forever and I am pretty impatient. So I tore out the tests and decided to do a slip stitch join because I am faster with a crochet hook than a tapestry needle. After I got that straightened out I needed to figure out a way to get the blocks random while still being balanced. So in all of my nerdiness, I went to excel for the answer. 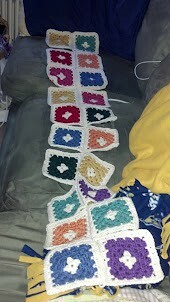 I knew my blocks were about 5.5" so I putzed with widths to figure out how big I wanted the blanket to be. This will be about 4' by 5'. Now isn't that geeky? 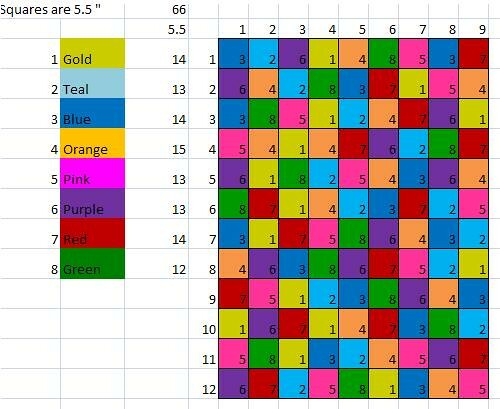 Anyway after refreshing the random formula I saved my favorite configuration by pasting over the formula and then tweaking it so the same colors were not next to each other. Here is what I have done so far. I probably need to move to my table to continue to work on this. I can't wait to get more squares done to add to the blanket! 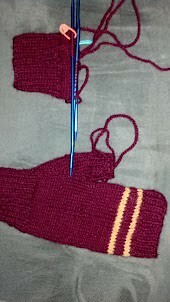 As far as the Gryffindor adventure has gone, the wristlets are super easy and fast. I made one earlier in the summer and put it aside to finish the scarf. When I started the second wristlet, I realized I made the first one wrong. 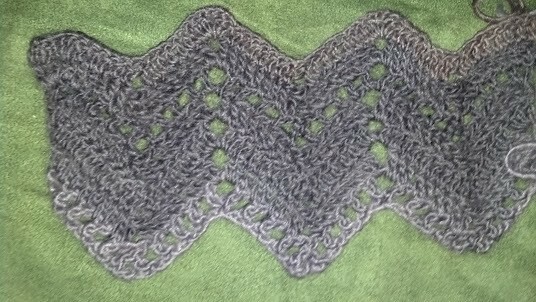 I put the gusset in the wrong place so I am working on what is now the third one. I did rip back a bit to fix my counting error and now it looks a lot better. 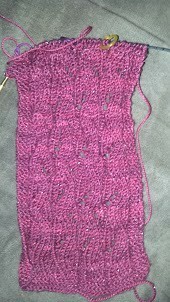 Now that I know how many stitches are in each row, it's easier to keep track of now. I like the variation already! I made some progress but until it's blocked it really just looks like a sparkly pink blob. So I feel as though my crafting bug has been renewed. The weather is getting cooler and I have dreams of just snuggleing up under wool yarn and knit/crochet my way through winter. Are you making pulling out some old WIPs to get finished? Thanks, I tend to multi-task very well plus every Thursday is knit night and I get a ton done there. Oh wow, you know the guy I mentioned a little while back...same exact story! The lack of spark, the dodging, everything. I felt really bad because he didn't feel the same, but I just couldn't stand being around him and I didn't want to lead him on. I felt so relieved afterwards. We are probably secretly twins. Take care! I'm also so glad to see that you are crafting again, everything is looking so pretty! Crazy! I know exactly what you mean. I would agree we are probably secretly twins. That looks like quite some afghan! Your WIPs are really amazing. You seem like you are really busy =). I really like the sparkly pink blog. It shows promise. Gray falling water scarf is beautiful.